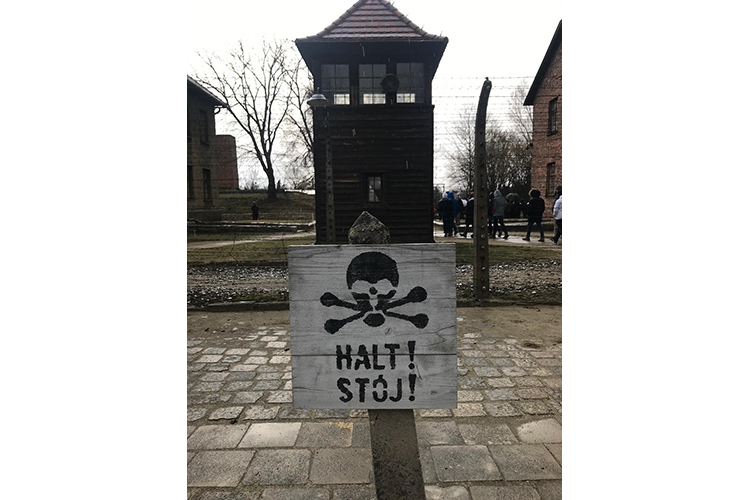 The Holocaust Educational Trust provides pupils from across the United Kingdom the opportunity to visit the former Nazi concentration and death camp of Auschwitz-Birkenau in their ground-breaking ‘Lessons from Auschwitz Project’. Their aim is to educate young people from every background about the Holocaust and the important lessons to be learned today. The programme consisted of an orientation seminar, the visit to Poland, a follow up seminar and the journey to becoming an ambassador. We feel very privileged to have taken part in this project and to have represented Lurgan College. At the first seminar we discussed, in groups, our thoughts on the Holocaust, including pre-war Jewish life and our expectations of the trip. After, we heard a testimony from Janine Webber, an 86 year old Holocaust survivor from Poland. Her words had a huge impact on us as she expressed her fear as she experienced the loss of her family members such as her parents and younger brother. She highlighted the struggle of having to survive on her own, in addition to her feelings of isolation and starvation throughout the war. We were amazed by her bravery and her strength to continue to share her story, in order to achieve a less prejudiced world. On the 5th March 2019, our trip began with an early morning flight to Kraków, Poland. After, a one hour bus journey our first stop was at one of Oświęcim’s pre-war Jewish sites. We stood in the towns main market square were the Jewish people stood before being deported; before the war, like many towns in Poland, Oświęcim had a large Jewish community which by 1939 made up 58% of the population. However, many of these people were then sent to camps across Europe with only one returning to the town after the war. 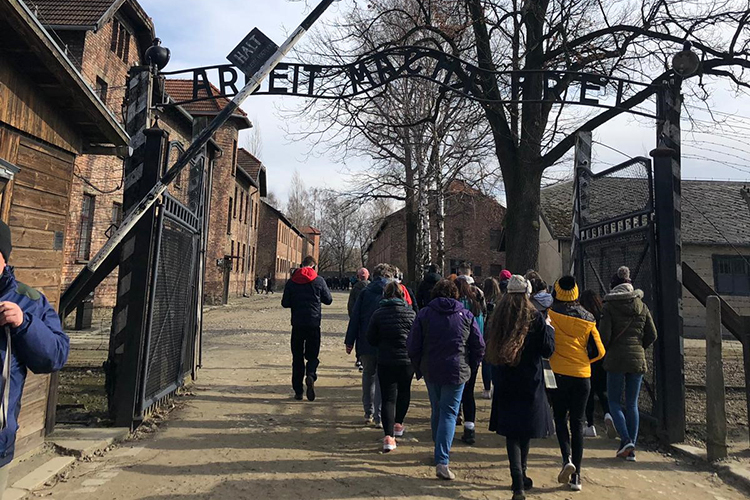 Our second stop was Auschwitz 1, a guided tour which led us to see the infamous entrance gate, followed by the buildings which housed many of the Jewish prisoner’s items that had been discovered after the liberation of the camps. These items consisted of the confiscated glasses, shoes and luggage which were labelled with the originating countries. Hundreds of photographs of the prisoners lined the halls of the blocks which were captioned with their name, date of arrival and date of death. 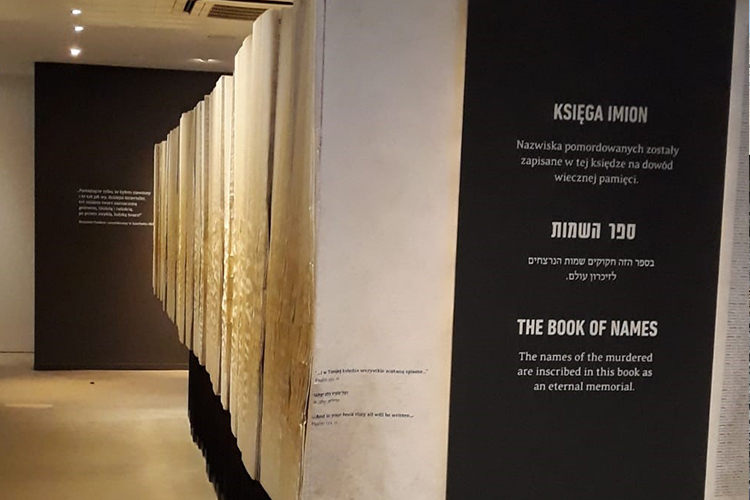 We were astonished when we saw the ‘Book of names’ which contained over 4 million names of the murdered as an eternal memorial. 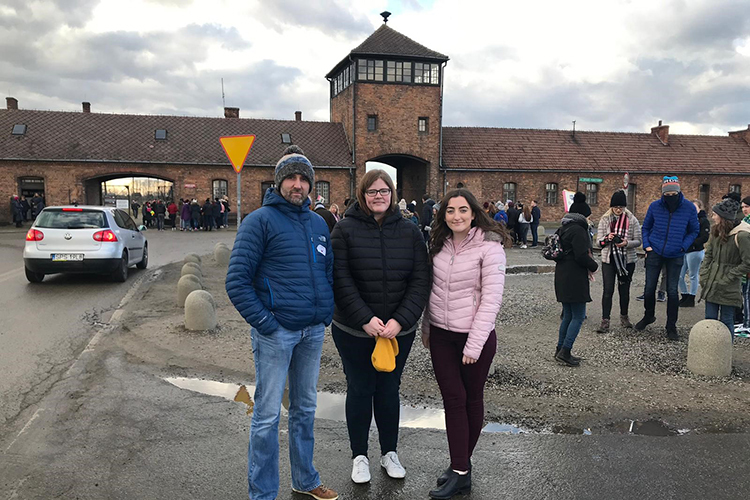 Our third stop was to the second camp, Birkenau, the magnitude of the camp site appalled us all as we could never have imagined it to be of such a large scale. 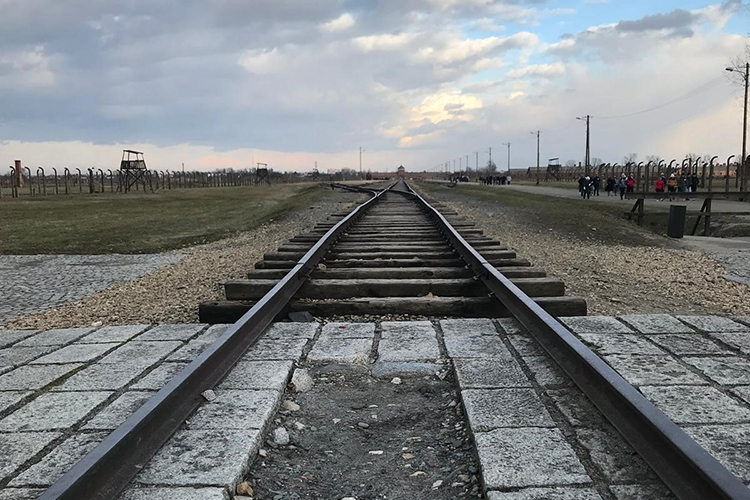 We walked along the train track which brought the Jewish people straight into the camp, their fates were decided by a flick of the commander’s thumb, they would be a labourer until death or sent to be immediately killed. We participated in a ceremony of remembrance to commemorate all the 1.1 million lives that were lost there. The service was led by a Rabbi, who joined us in lighting a symbolic candle of change and honour. The final stages of the programme sadly came to a close in our second seminar. 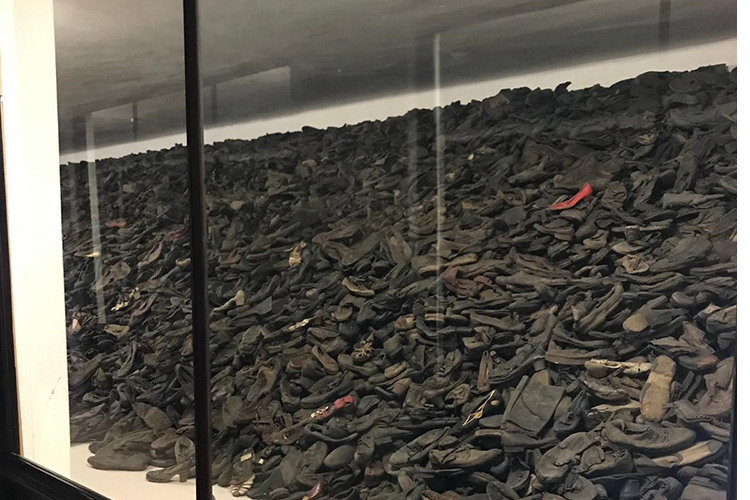 Once again, we discussed our thoughts and feelings with our group as we reflected upon the visit and the contemporary relevance of the of the lessons of the Holocaust. It taught us all as young people the dangers of prejudice and racism if it becomes acceptable, therefore we should not be bystanders and instead try to combat this discrimination in society and highlight the importance of embracing our differences. Overall this trip was a great experience for Mr McCallan and ourselves. It has totally changed our perspective on the Holocaust as we now plan to spread the lessons we learnt and take action as ambassadors for the Holocaust Educational Trust. We would encourage others to think and learn more about the Holocaust to prevent any further discrimination and prejudice in our communities.